This is part two of a three part series. 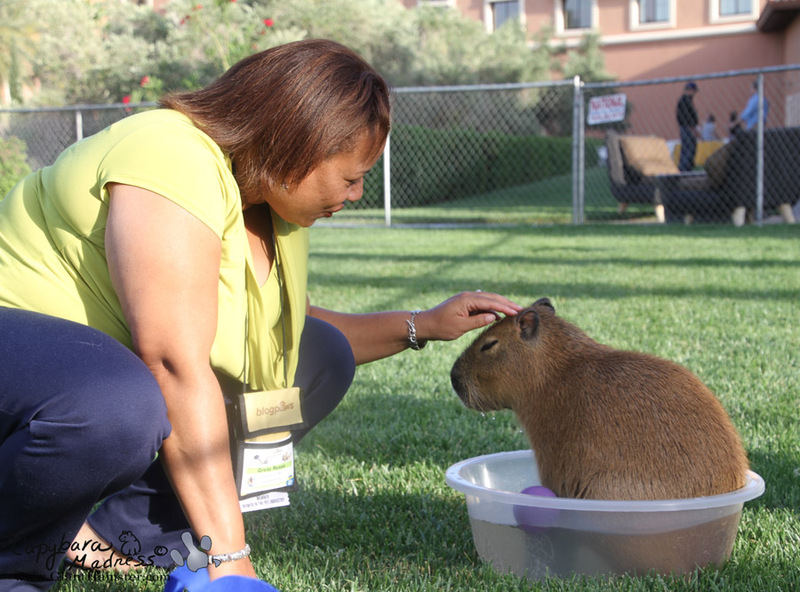 Conference Capybara is the first part of the story of little Mia Davisson, the six-month-old niece of Garibaldi Rous and daughter of Wesley and Fiona at the 2014 BlogPaws conference. In the photo above, you can see Mia likes a nice soft bed but has her doubts about cameras. 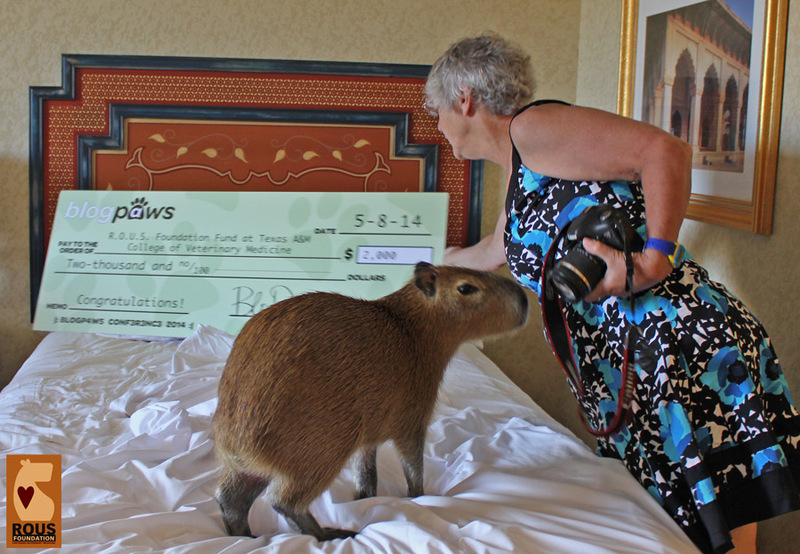 Later, she chewed a corner off the giant check. 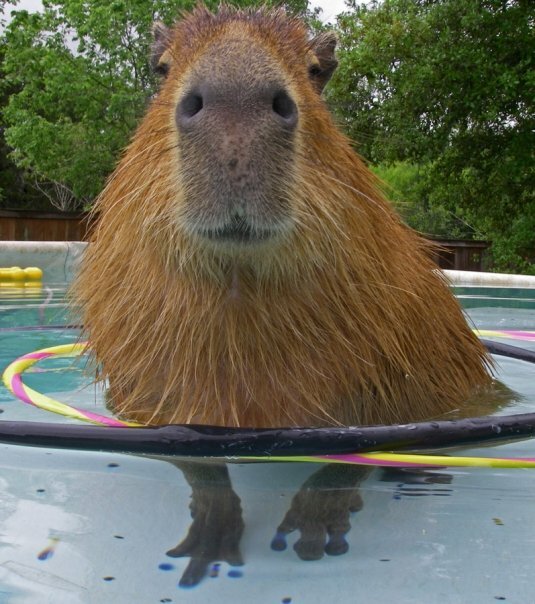 Just to be fair, I need to remind people that as much as I love Mia, she is not my capybara. She belongs to Georgianna Davisson, whom she loves very much. That makes me jealous but I am working on getting over it. Georgianna has a huge phone and I’m not sure if Mia is thinking of making a call or just looking at her reflection in the screen. Or, more likely, she’s contemplating stepping on it and breaking it. 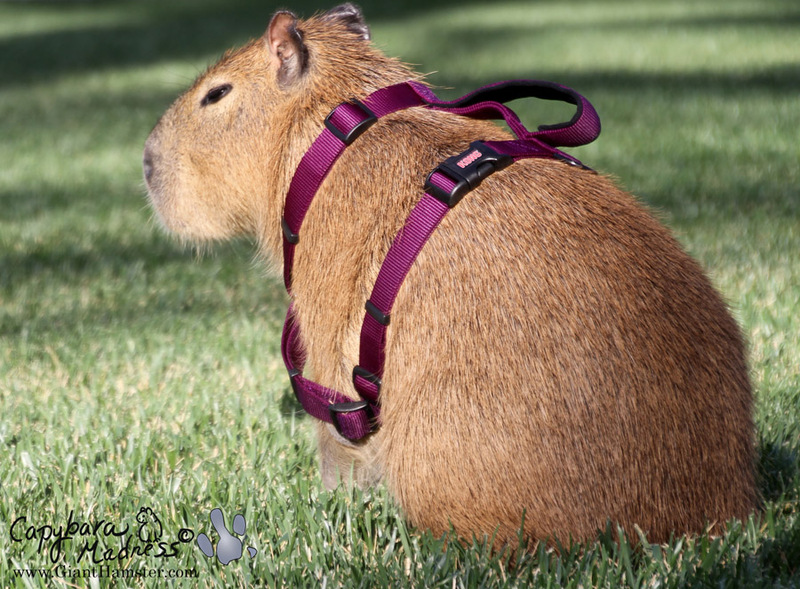 As with all capybaras, it’s easier to harness Mia than to keep a harness on her. Actually, she was really good. She didn’t get completely out of her harness even once, though she had one foot out about half the time, as she does in the photo above. 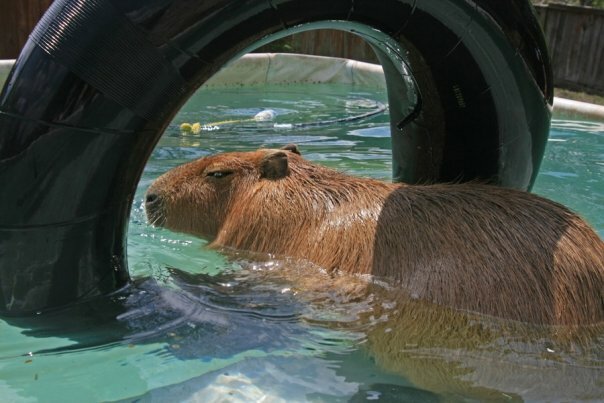 I think when a capy turns his/her back to you, it is a sign of trust. In the wild this kind of behavior allows the members of the band to watch out for each other. Gretta Russo was one of Mia’s favorite admirers. She, Georgianna and I along with other members of Mia’s entourage, spent many hours lazing around in the sun in the dog park. The weather was perfect for it, not too hot, not too cold. 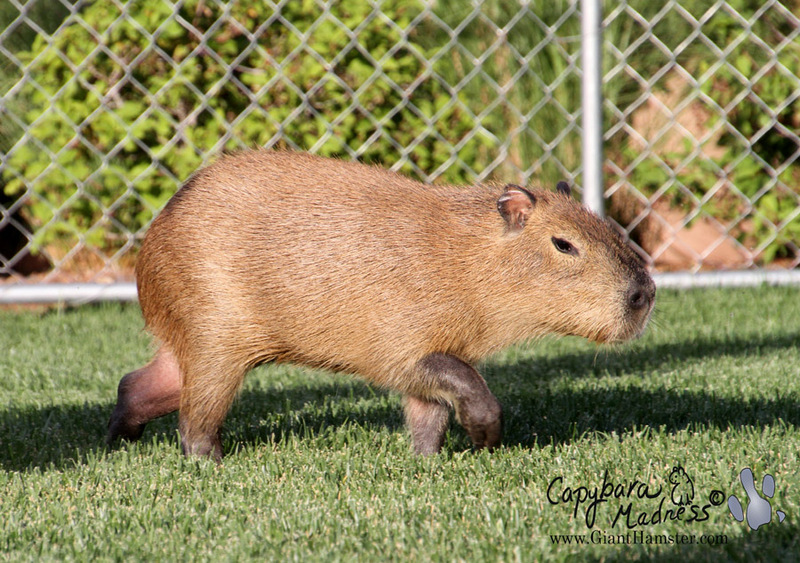 I love the way capybaras curl their toes when they walk. 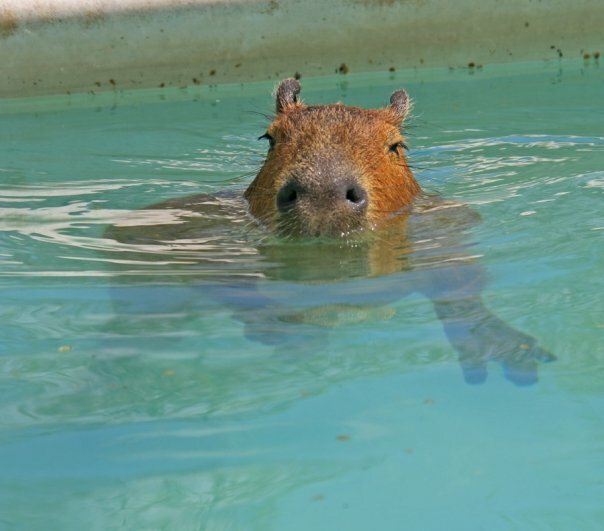 They look so dainty and so determined. 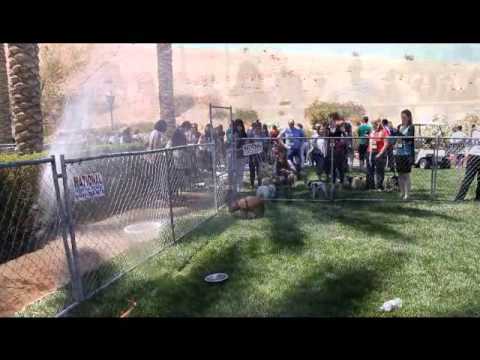 Georgi and Mia and I were sitting around, enjoying lunch and talking to people when suddenly a water pipe broke! I scrambled out of the way to protect my camera. Luckily (for me), Georgi took the brunt of it. Mia was quite ecstatic. 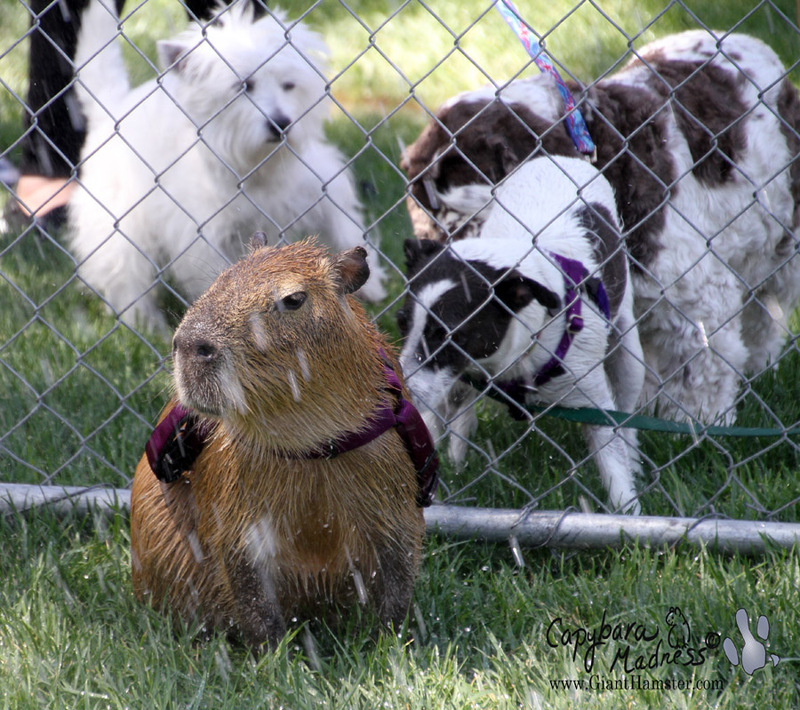 In her opinion, it was just what the dog park was missing. What’s better than eating fresh, green grass? 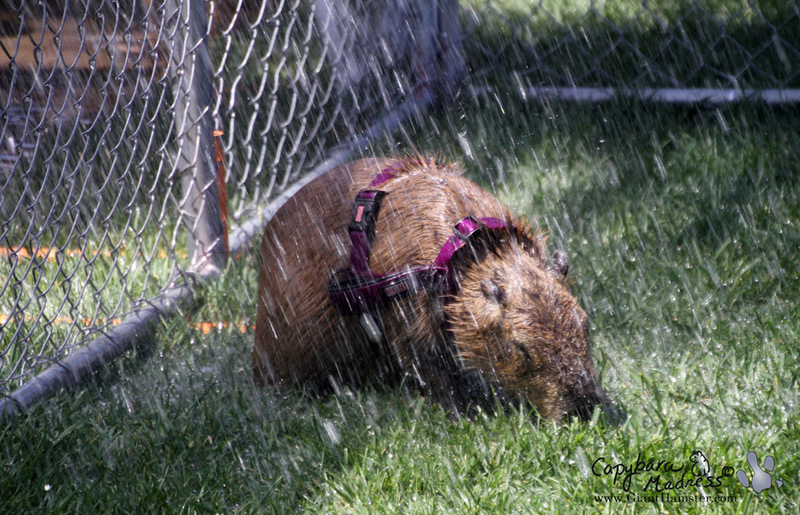 Eating fresh, green grass in a puddle. A few dogs came over but they didn’t seem to be having the fun Mia was having. 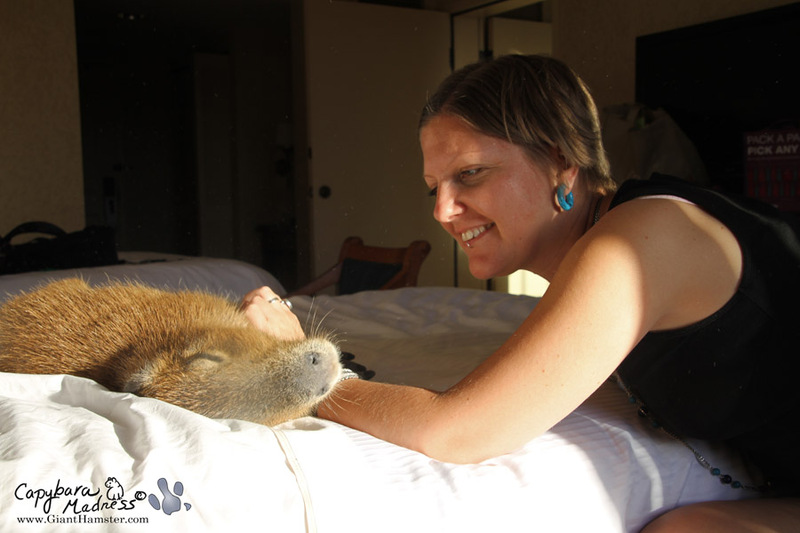 After a long day at the conference, Mia collapses into bed, as long as someone is there to scratch her belly. In this case, it is my daughter, Coral. You don’t really need that bracelet, do you? 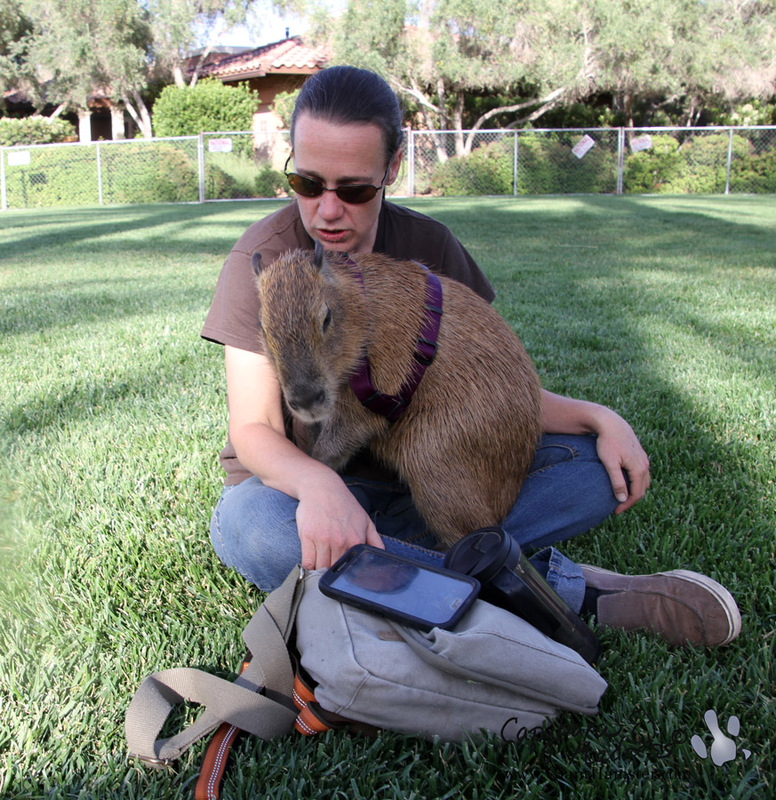 Mia was exceptionally good about not chewing on things, but in this image you can see her capy-curiosity got the better of her and she had to try a taste of Coral’s bracelet. She also managed to chew through the leather strap for my purse, but I’m not complaining. 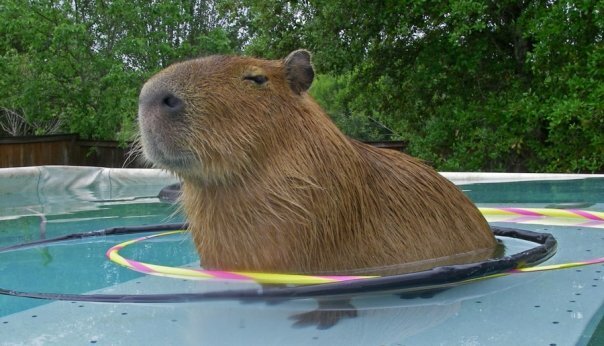 In the next exciting installment, we will meet the incomparable capybara duo of Romeo and Tuff’n Reeder! Stay tuned! 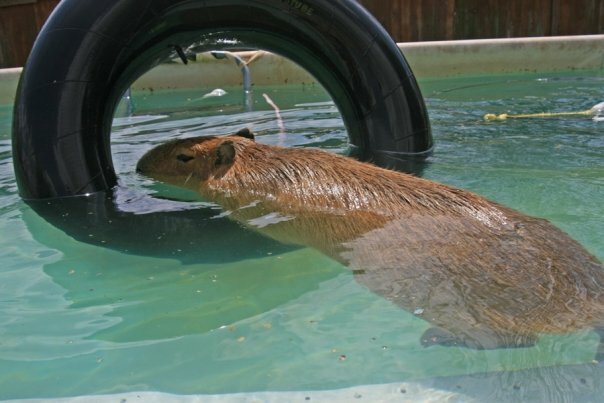 i know this will sound odd to non capy folk, but you can see the family resemblance! 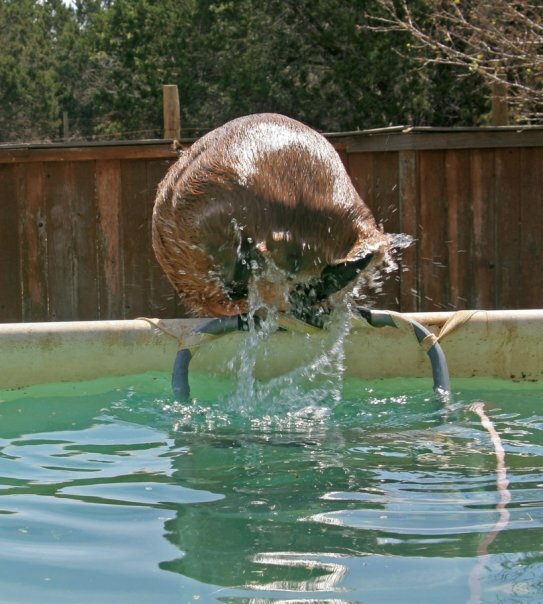 More fun photos. 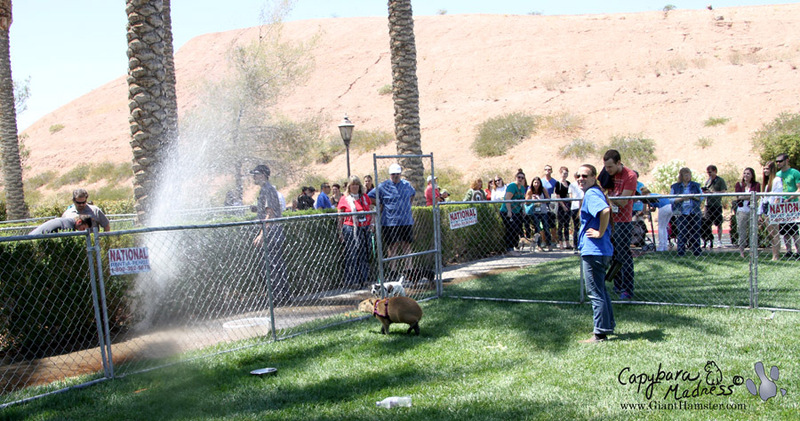 Looks like she was totally enjoying the sudden waterfall. It is so good to see you and, I don’t know how you’re feeling, but I’m so happy to see that you look very healthy! 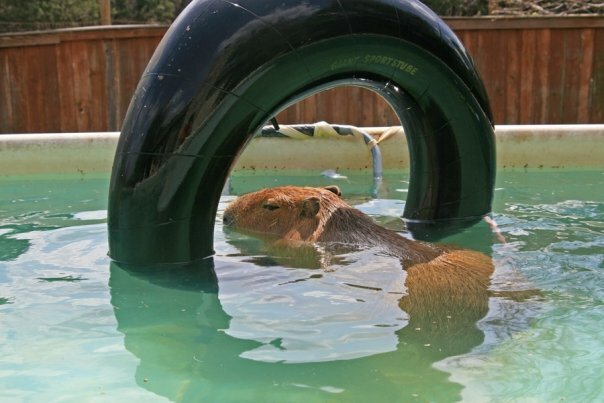 Keep having fun with your capy friends! 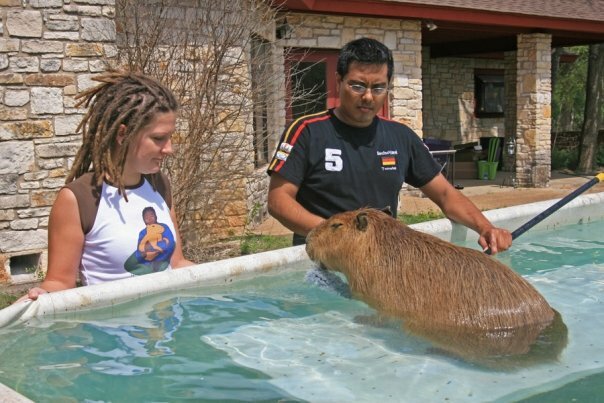 I’m so glad you got to spend time with capybaras, even though you couldn’t be with your own. 🙁 I hope you can continue to get support for the ROUS foundation so that these untimely deaths can be prevented in the future.